A roof collapsed at the construction site of a South African shopping mall killing one person, officials say. About 50 others are feared trapped at the construction site. 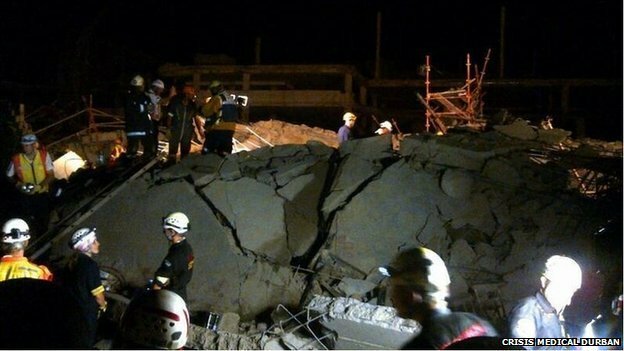 Rescue teams are working in the dark and are using sniffer dogs to look for survivors beneath the rubble at the site in Tongaat, north of Durban. About 30 people had been taken to hospital – some with massive traumatic injuries, paramedics say. Officials said those trapped were construction workers. The deputy mayor of the municipality told South African media that authorities had obtained an injunction a month ago to halt construction at the site. “There are areas of the law that they [construction firms] did not follow in terms of building,” Nomvuzo Shabalala told broadcaster ENCA. “We were not aware that they were continuing building,” she added. Chris Botha, from the ambulance company Netcare 911, said it was too early to know the cause of the collapse. The accident happened around 16:30 local time. About 100 rescue workers are at the scene, where hydraulic equipment is being used to break through the concrete blocks. Tongaat is a small town about 25 miles north of Durban and has a large South African Asian population. Nearby transport routes to Tongaat had been affected as the main road through the town has been shut to traffic and trains have been stopped.